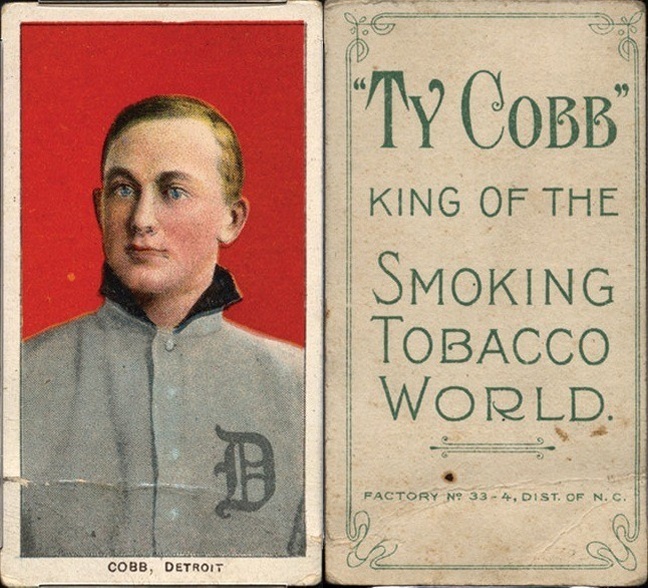 When I think of pre-War baseball cards I instantly think of Ty Cobb baseball cards. To me, he represents that segment of the hobby better than any other player. Sure, the T206 Honus Wagner may be the most expensive pre-War card. And Babe Ruth cards may be the most sought-after pre-War cards. But Ty Cobb cards are consistently atop the list of key cards of all the key pre-War sets. And they themselves aren’t cheap either. Just look at our list of most valuable baseball cards and you’ll see his cards all over it. In 1911, subscribers to the Sporting Life had the opportunity to collect this set which was offered in twenty-four different series of twelve cards each. 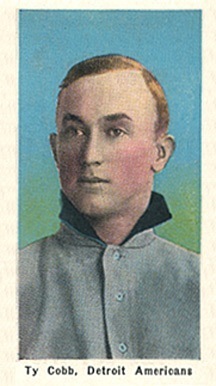 Cobb's cards are a key to this set and actually come in two different versions: the more common pastel-colored background and the rarer blue-colored background. You'll also notice that this card features the same portrait (although zoomed in) of Cobb as the green and red portrait T206 issues. Ty Cobb and Sam Crawford were notorious for their double-steal ability during their heyday so hobbyists get a chance to collect that extra piece of history with this card. The card design is unusual as they show one player when open and another when folded. Crawford and Cobb essentially share the same pair of legs on this baseball card depending on how you fold it. Distributed with Mecca cigarettes, this set is also thought to be the first to feature player stats. Because they were intended to be folded, wear and tear are common issues with these cards. Up next on our list is one of the hobby's most classic cards: the T205 Gold Border Ty Cobb. This card is instantly recognizable due to its intricate design and infamous gold borders. While those gold borders offer up strong visual appeal, they also present one of the hobby's biggest condition challenges: finding specimens without a lot of wear along the borders. Cards of this era are tough enough to find in high-grade condition even without colored borders. But like any non-white border, these beautiful gold borders easily show the slightest nicks and dings if damaged. That's what makes this issue one of the hobby's most expensive if you can find it in top grade. There are four different Ty Cobb cards in the legendary T206 set and this is one of the two portraits. This "Red Portrait" is the least scarce of the quartet and therefore the least expensive. That is, unless you're lucky enough to find one with the "Ty Cobb" back. That's the thing about these cards: the variety of different backs can also have a huge influence on the rarity and value of the card. Regardless of which type of back you're talking, the red background on the front of the card can also appear in different hues: some appear almost orange while others are a deep red in appearance. The hue of red itself won't affect the value of the card. It's the back of the card and overall condition that will be the main influences on value. Not only is the "Green Portrait" the rarer of the two Cobb portraits in the T206 set, it's the toughest of all four T206 Cobb cards. Centering is hands down the primary factor that keeps the Green Portraits from achieving top grade as they're rarely found with good centering. Even if it weren't as valuable as the Red Portrait, this is the better-looking of the two. I just prefer the green background to the red for some reason. The "Bat Off Shoulder" is the only T206 Ty Cobb card to date that has achieved the lofty PSA 9 Mint status. Hence, the huge price estimate of nearly $300,000 for a mint condition specimen. The imagery of the "Bat Off Shoulder" T206 Cobb is the best-looking of the quartet, in my opinion. A stern-faced Cobb stares off into the distance atop a multi-colored background to give this card terrific eye appeal. And last but not least in the quartet of T206 Cobb cards is the "Bat On Shoulder" Cobb. The legendary hitter stands ready in his stance, choking up on the bat and staring the pitcher down. The light coloration of the background give the card an overall smooth and calm tone despite the intimidating stare from Cobb. It's the least expensive of the four cards but still one that any serious Cobb collector should strive to own. Ther T202 Hassan Triple Folder cards featured black and white images in the middle flanked by two smaller side panel baseball cards. The center image is flanked on either side by card panels of one of three combinations of players. Cobb appears on six different cards in the set either as one of the side panels, one of the center pictures, or both. Easily two of his most recognizable cards, the 1914 and 1915 Cracker Jack Ty Cobb cards are nothing short of hobby icons. The imagery on their fronts is the same so the easiest way to tell them apart is by their reverse sides. The 1914 issue features print on the back that is right side up while the 1915 issue features printing that is upside down. With 144 cards in the set in total, Cobb is one of the keys alongside legends like Christy Mathewson, Shoeless Joe Jackson, Honus Wagner and Walter Johnson. Because there was a redemption program for collectors to send in for the 1915 issue, it's a bit easier to find Cobb's card in higher grade than its 1914 counterpart. Whether you're looking at either version, there's no question that the imagery on these cards is among the finest on all his cards. Collectors get a sense of what it was like to be an opposing pitcher and having Cobb stare right back at you. The 1915 M101-4 Sporting News (as well as the M101-5) set is perhaps most famous for housing the Babe Ruth rookie card. But Cobb is unsurprisingly another key to the set. Cobb stands ready to bunt in this classic black and white photo by Charles Conlon making this one of the few Cobb cards to feature photography instead of artwork. Unfortunately for collectors, Cobb was not featured in the 1916 M101-5 set so this is the one chance to own Cobb in a legendary Sporting News set. This beloved set was released in 1932 by the United States Caramel Company out of Boston, Massachusetts, and featured 32 cards in total. Kids who collected these cards were offered the chance to send in a complete set to redeem a baseball or three complete sets to redeem a baseball glove. For those lucky enough to have kept the cards instead, their values have soared tremendously over the years. Packed with Hall of Famers, this set depicts players atop rich, red backgrounds. By 1932, Cobb was no longer playing but fortunately for collectors, he was included in this iconic set. Ty Cobb joined Babe Ruth and Carl Hubbell as the only baseball players to be included in this set that featured 48 cards in total of athletes from a variety of sports. Cobb was chosen to be the first card in the set and is a key overall but not the most valuable. The card is beautifully designed and features an older Cobb atop a golden background. It's another card printed after his playing days but that has not kept it from being one of the top cards that Cobb collectors chase down today. Ty Cobb baseball cards are at the top of most every pre-War card collector's want lists and for that reason their values will continue to remain strong for quite some time. Cobb was so good that he actually received more votes than Babe Ruth on the Hall of Fame's inaugural ballot. The Georgia Peach was known as being a hard-nosed player who played extremely tough, dirty at times by today's standards. But more than anything, Cobb was known for his ability to hit the baseball. He'd finish with a .367 batting average and would amass 4,191 hits, a record that would stand for decades until Pete Rose finally broke it. 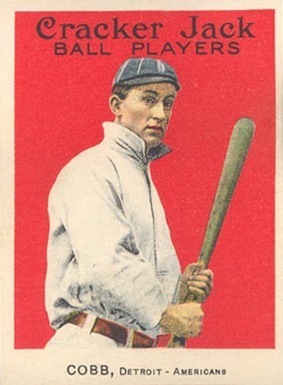 Cobb's cards are consistently keys among any sets in which he is featured and more often than not, his cards are the most valuable in those sets, too. There's no question that Cobb's place in the hobby is held in high regard and collectors will go to great lengths and pay extraordinary prices to chase down his cards.